Every year, a giant green figure lumbers through the Scottish village of South Queensferry in silence, stopping only to drink whisky. 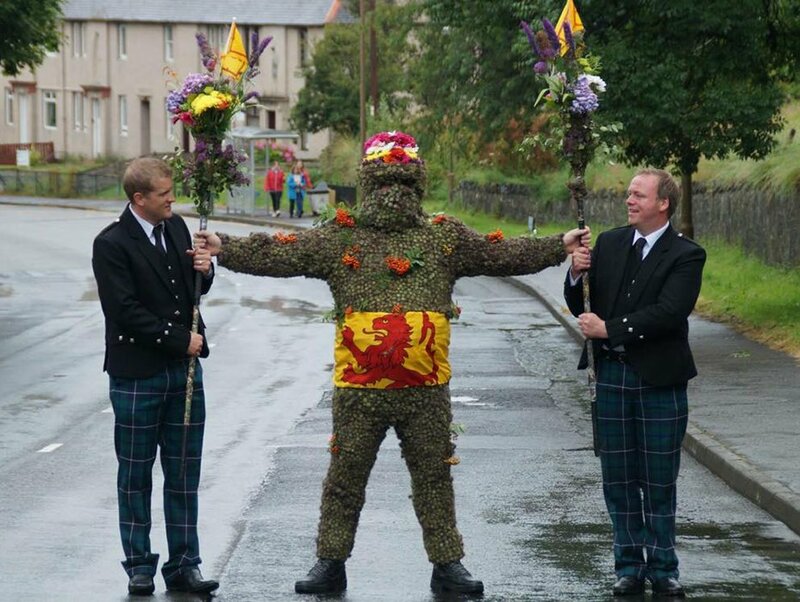 The mythic Burryman’s seven-mile procession lasts nine hours, and the villagers follow behind in a haphazard parade. The costume is unwieldy and he cannot refuse a dram, sit down or speak until the end of his tour. Andrew Taylor is the man beneath the cloak of burdock burrs. His commitment and passion for the daunting task is something we think deserves a dram – though maybe a more comfortable one than he’s used to. But where did this tradition come from? “The beauty of the Burryman is that nobody knows the real reason it all started,” says Andrew. Andrew isn’t the first person brave enough to cover himself in burrs. He took over the role eight years ago after the previous Burryman retired. “I just fancied doing it, so I spoke to him and he did a wee bit of a background interview, and then I walked round with the Burryman on his last day. I took over after that. “I didn’t realise how much actually goes into it. You don’t just turn up on that day. There’s so much preparation to do before. You need a good team, which I’m lucky that I’ve got. Mr Turner and his family collect thousands of burrs the week before the event, “and I’m a big Burryman, so there’s a lot of burrs to be picked!” he laughs. Mr Turner can’t refuse a dram on his travels, which has translated into a passion for whisky. “When I first took over the Burryman, I hadn’t drank much whisky, but since becoming the Burry man I have acquired a taste for it,” he says. His favourite drams when he’s out of his costume are a Dalmore and a Dalwhinnie.